The Law Society of Ireland is the educational, representative and regulatory body of the solicitors’ profession in Ireland. The Law Society exercises statutory functions under the Solicitors Acts 1954 to 2011 in relation to the education, admission, enrolment, discipline and regulation of the solicitors’ profession. It is the professional body for its solicitor members, to whom it also provides services and support. LUAS stops (Central Zone on the Red Line) near Blackhall Place are Smithfield and the National Museum of Ireland. Bus routes serving Blackhall Place are 37, 39 or 70. From the city centre, go to Burgh Quay. You can also take the number 90 bus which runs between Tara Street DART station and Heuston Station, each way. Heuston Station is a 10 minute walk from the Law Society of Ireland. If driving from the north west of the city you should travel down the Navan Road, along Prussia Street and Manor Street until you come to the top of Blackhall Place where you will have to turn left onto North King Street. Keep right at the fork in the road, giving right of way to traffic coming from your left. Proceed along Queen Street to the first set of traffic lights and turn right into Blackhall Street where you will be facing the Law Society building. Keep to the left of the Y junction. Enter the Law Society through the gate opposite this junction. From the west of the city, whether driving from the direction of Kilmainham or the Phoenix Park, you should proceed along the North Quays, get into the left-hand lane and turn left at the James Joyce bridge (white metal bridge), cross the Luas tram track on Benburb Street. The entrance to Blackhall Place is past the bus stop on the left and just before the second set of lights, which are at the junction of Blackhall Place and Blackhall Street. From the city centre you should travel along the South Quays to the James Joyce Bridge (white metal bridge) where you should turn right, proceeding across the bridge and the Luas track on Benburb Street. The entrance to Blackhall Place is past the bus stop on the left and just before the second set of lights, which are at the junction of Blackhall Place and Blackhall Street. There will be limited parking on the grounds of the Law Society for the EdTech 2016 conference, reference EdTech to security on your way in. EdTech delegates can avail of a special parking rate of €6 per day for the conference at the Park Rite Car Park (Smithfield) on Queen Street. The car park on Queen Street is open from 7:00. Take your parking ticket to the EdTech Registration area in the Law Society and a member of the team will stamp it for you. Present it then at the Kiosk in the car park (open from 7:00 to 19:00) to avail of the special rate of €6 for the day. 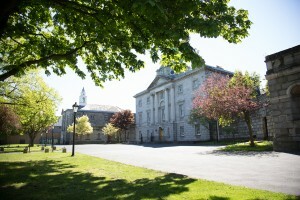 The Ashling Hotel is located a short walk (less than 5 minutes) from the Law Society of Ireland and is close to Heuston Station, Collins Barracks and the Phoenix park. The Luas red line to the city centre passes right in front of the hotel with the nearest stop located at Heuston Station. The Aisling Hotel is holding a block of 10 rooms at a rate of €104.00 single BB and €124.00 double BB. These rooms are on a first come first serve basis. Once the 10 rooms are gone at this rate guests can book at the best available rate. All guests are to have valid credit / debit card details at the time of booking and will have to settle their own accounts on departure. Any rooms not booked by 26th April will be automatically released. The reference number to quote for EdTech bookings is 172716. Situated at the junction of St. Augustine Street and Oliver Bond Street the apartments are superbly located only a mere stone’s throw from Christ Church Cathedral and within walking distance from the vibrant Temple Bar district which offers a vast array of bars, restaurants, cafes and galleries. It is approximately 5-10 minutes’ walk from the Law Society. Quote EdTech for any bookings. The Spencer Hotel is a modern four star hotel and leisure centre in the heart of Dublin city. The Mayor Square Luas stop behind the hotel runs to the Law Society of Ireland and Heuston Station. The Spencer Hotel will endeavour to provide competitive rates if EdTech delegates contact them early. Maldron Hotel Smithfield is a highly-recommended hotel located less than 5 minutes from the Law Society in the hub of Smithfield Square. This hotel is located adjacent to the Jameson Distillery, the Smithfield Luas red line stop and numerous cafés and bars. Maldron Hotel Smithfield will endeavour to provide competitive rates if EdTech delegates contact them early. Maldron Hotel Parnell Square Dublin is a contemporary Dublin City centre hotel. This stylish boutique hotel is located just a short two minute walk from O’Connell Street, one of the capital city’s main entertainment hot spots and shopping destinations. It is approximately 10-15 minutes’ walk to the Law Society. Maldron Hotel Parnell Square will endeavour to provide competitive rates if EdTech delegates contact them early.